If there’s one dish that you must eat when you visit Singapore, it’s their chicken rice. American celebrity chef Anthony Bourdain swears by the dish, which is better known as Hainanese chicken. The rice is sautéed in chicken fat and then cooked in chicken stock, and served with poached, shredded chicken with a basic assortment of vegetables such as spring onion and coriander. Of course, there are sauces to eat with it. For those who can’t fly out to Singapore for the real thing, Shiro in Mumbai brings some classic Singaporean dishes on a limited menu this week. The spread leans towards non-vegetarian fare since it’s hard to look past meat of all kinds and especially the live seafood counters when you’re in Singapore. Still, they’ve tried. There are things like fried tofu in chilli sambal sauce and stir-fried cashew vegetables in hoisin, oyster and soy sauce, but when there’s an equivalent of a national dish on the menu, these dishes might get sidelined, and rightfully so. The Singaporean chilli crab is as tasty as is messy. Cooked in a fiery chilli tomato gravy, which turns stringy with the addition of egg yolk, the chilli crab is a dish you’ll be mopping up clean with mantou buns. 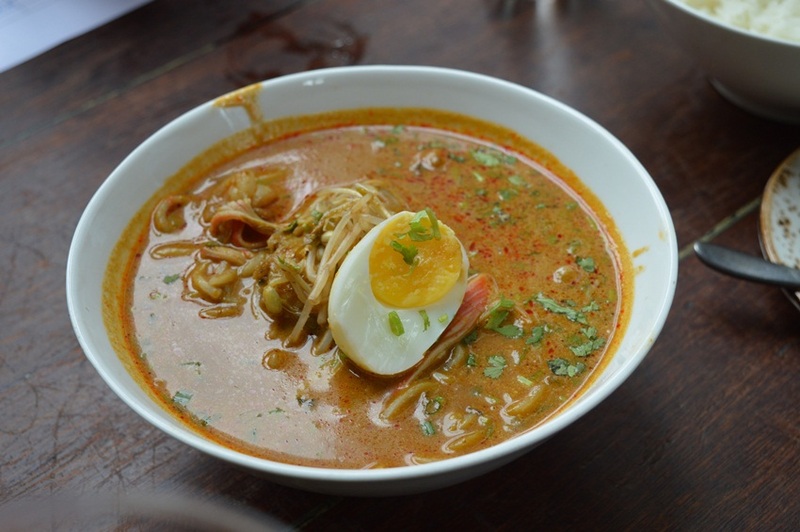 The Mumbai weather, which is currently see-sawing between warm and sticky during the day and pleasantly cool at night, calls for the flavourful bowl of soupy Laksa noodles after sundown. The rice noodles, cooked with either prawn, chicken or fish, are served in a broth of coconut milk, with a hint of gelugur or tamarind. What’s not to love about hot, sweet and tangy? And whatever else anyone tells you, trust Bourdain when he says nobody drinks the Singapore sling in the city. But a combination of gin, cointreau and brandy flavoured with pineapple juice, angostura bitter and lime juice sounds absolutely insane, and we’re going raise a toast with that.